It truly is Black Friday at my house today. We are busy cleaning up from yesterday's feast and putting away all the Autumn decorations, and I HATE IT! I don't want the season to end, I don't even want to decorate for Christmas yet. Even though I do love putting up Christmas lights and hanging ornaments on the tree. I'm just not ready yet, I need another month of fall! I took some photos of the Autumn/Thanksgiving decor before putting it all away. This little turkey is off of a Dianne Arthur's chart "Harvest Blessings". 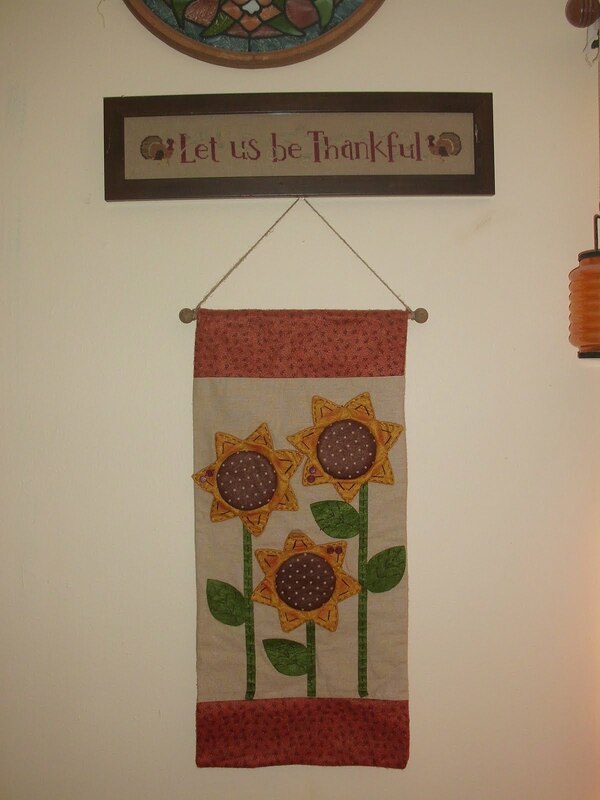 This one is of course a Bent Creek "Thankful Row" I love the red lettering and the vine behind it. This one I am not sure who the designer is, I purchased it off of ebay. 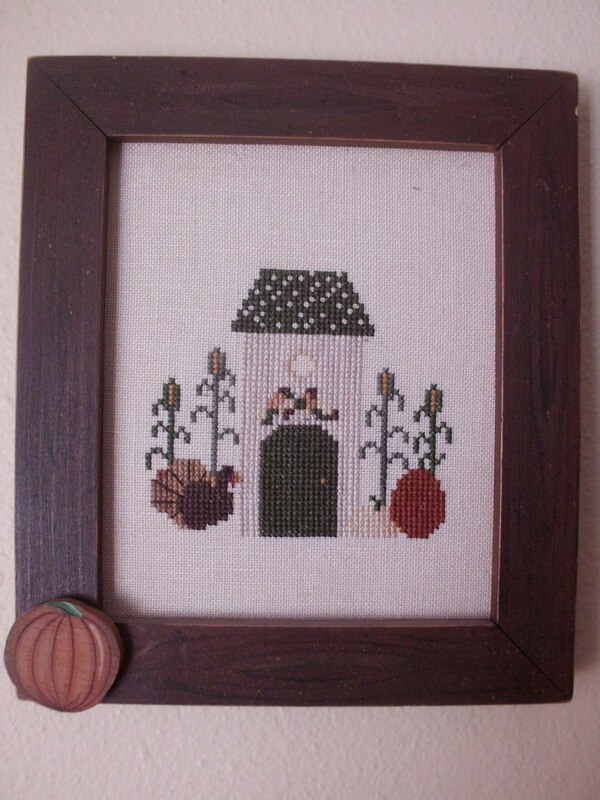 It came framed already, and I love the little pumpkin on the corner of the frame. If you know the designer i'm all ears? This is of course a Lizzie Kate design. 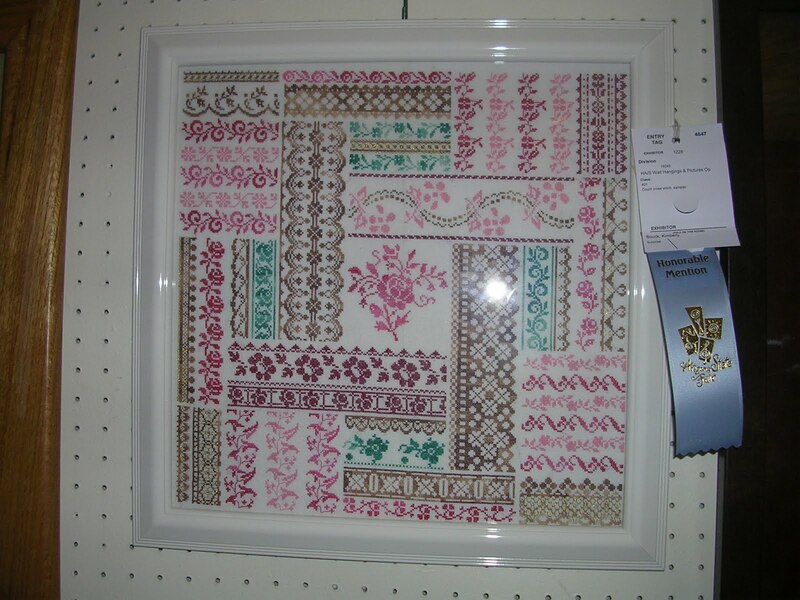 These square IKEA frames are great to pop in little seasonal designs. 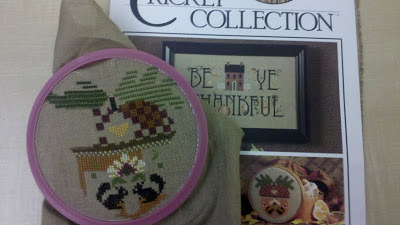 I have two or three that I just rotate my smaller stitches in and out of. 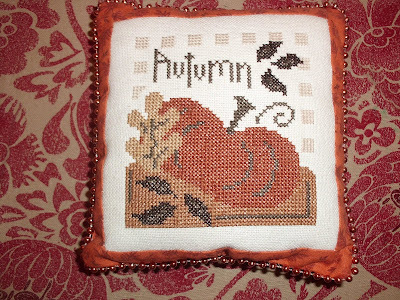 This one is "Autumn leaves", a pretty quick design just using DMC thread. Since our leaves don't change color here I like to pretend still. And really it's what leaves, we have palm trees and cacti! 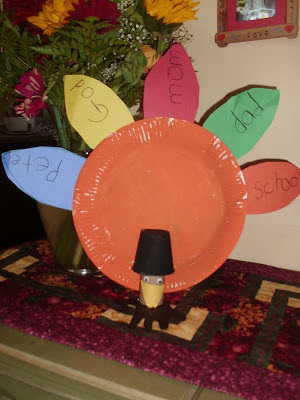 And this was made by my youngest, she is in kindergarten this year. She is thankful for God, School, Mom, Dad, and PETE!?! 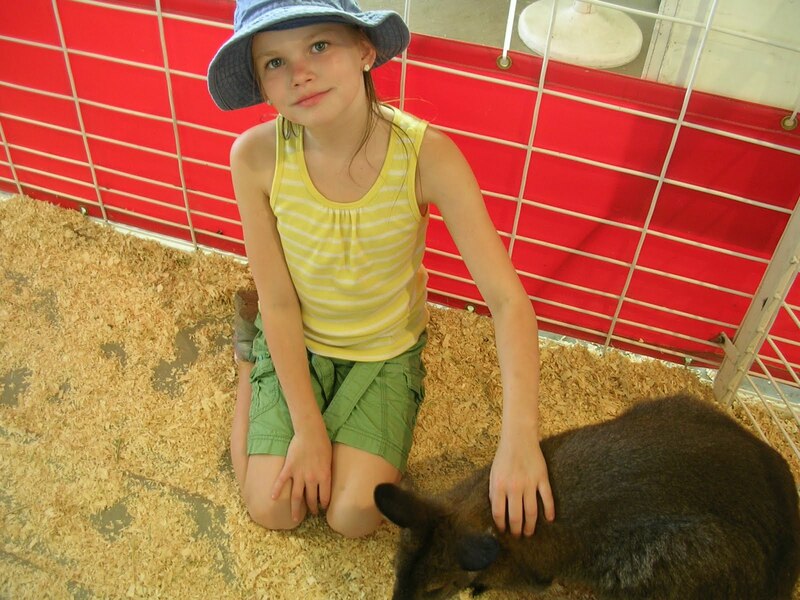 We all laughed about Pete, she meant to put "pets" and got confused on the spelling. Still dragging along on this one. I like it, I do. I just have other stuff I want to be working on, but i'm determined to finish this first. Fingers crossed it will be done this weekend. 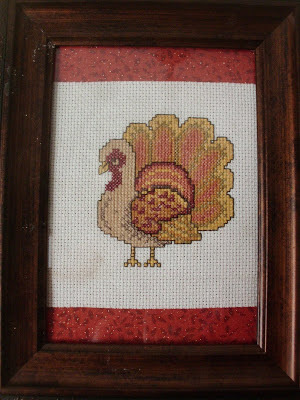 My other projects that are calling to me to work on before Thanksgiving are Bent Creek's Uber-Turkey (i'm about halfway done) and I want to start Bent Creek's Gobble. I always like their seasonal charts, and I love putting up different cross stitch for each season. 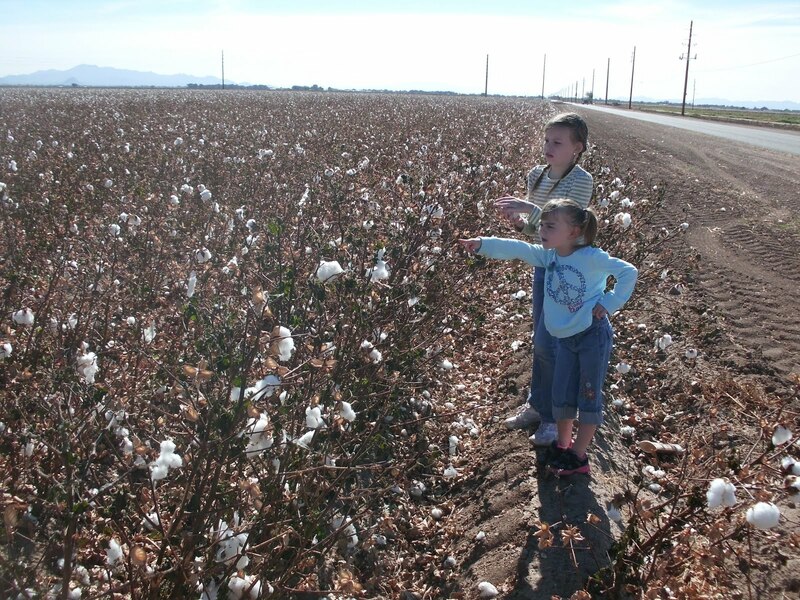 We spent our Veteran's Day exploring. We drove down to Tucson and on the way stopped to check out the cotton fields. We don't have as many cotton fields up around Phoenix, so it was neat to see it and tell them how their grandmother used to pick it by hand for like a nickel a bag. 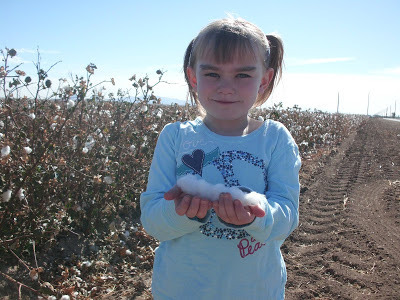 I knew they were my kids, when the found seeds inside the puffs and were excited over "all the money we will save stuffing pillows if we grow our own cotton!!". So we are going to try, not sure if we will actually get any cotton out of it but it will be neat to see if the seeds even sprout. 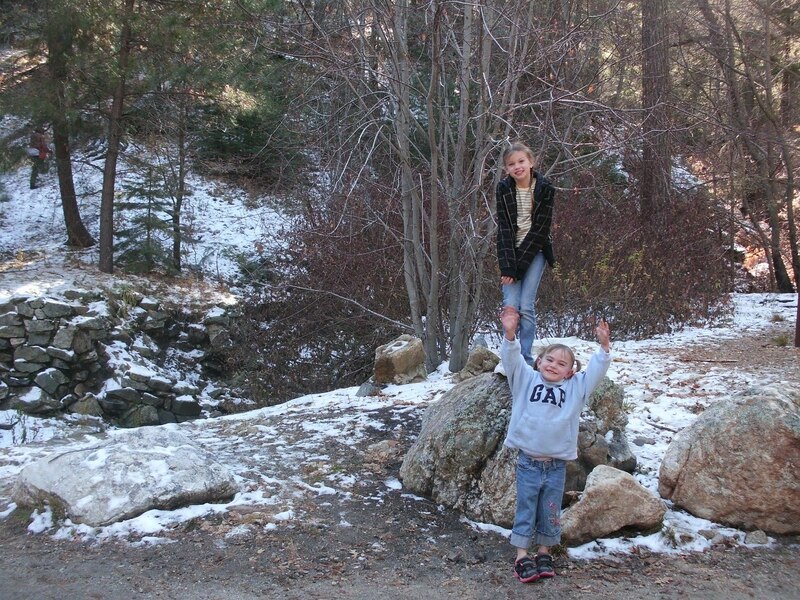 Being an Arizona girl at heart, I like to "visit" winter. I wouldn't want to live anywhere with real snow for several months of the year, but I can admit it is fun to play in the snow and be out in the chilly weather for short (very short) periods of time. And yes I do call that half inch of snow you see in the photo snow. Anything more than this and I would be bunkering down to hibernate and putting snow chains on the car. And this is down at Mt. Lemmon. It is amazing to go from the base of the mountain with saguaros and cactus to the top where there is snow and pine trees. 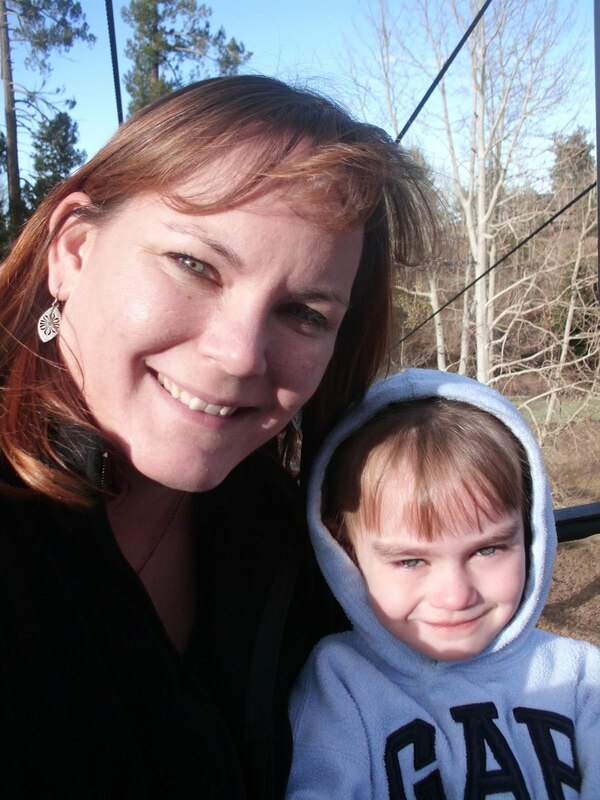 And this is my youngest, Zoe and I on the ski lift. 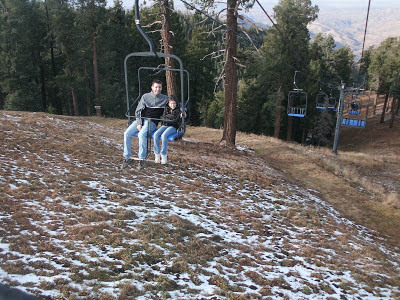 I have never been on a ski lift before (again I live in Arizona, winter sports aren't my thing). I temporarily forgot I was scared TERRIFIED of heights. And sweet boyfriend had reasured me "don't worry it's only 10 feet off the ground". 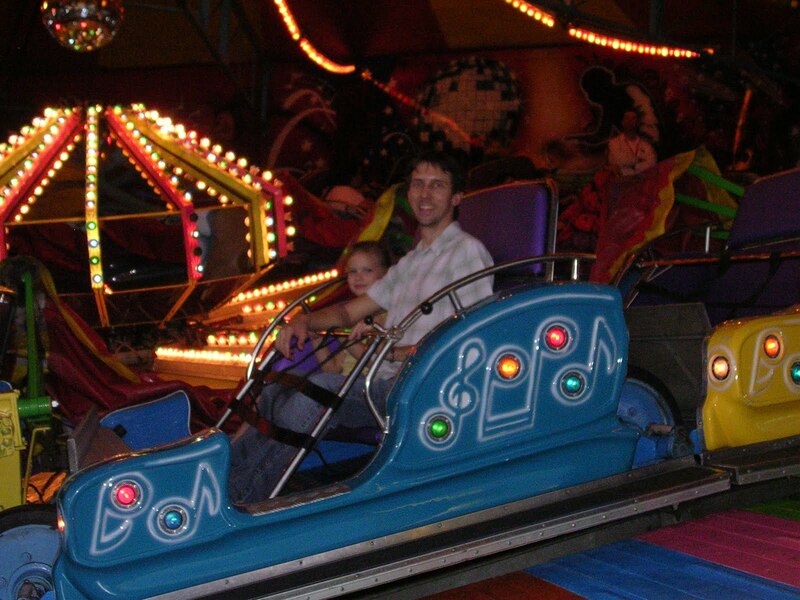 That was a lie, and then the chair was swaying in the wind, and bouncing when ever it went past a pole. If my youngest hadn't been on with me, I would have made them stop the ride and get me down! Never again! Yes the mountain was pretty, but that ground underneath looked hard and sharp. How is this taking so long!!! Uggh this has taken me all week just to get this far. I like the design, but in my head I was thinking small=quick. So far this one has been dragging a bit. 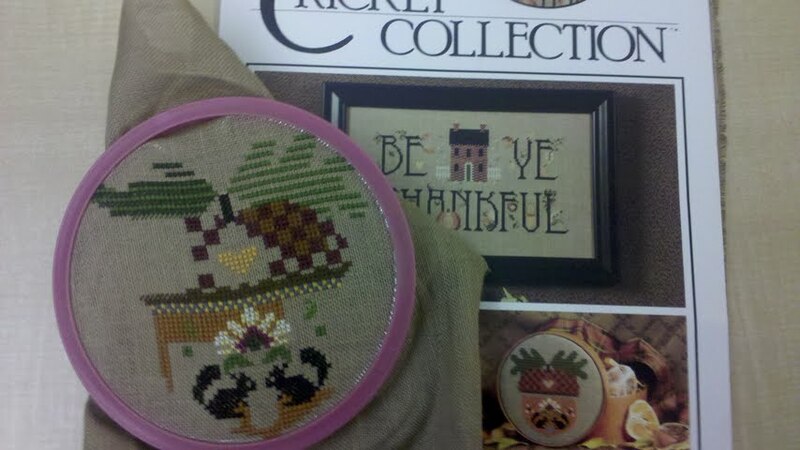 It is Cricket Collection, the chart is from 1997 (I graduated high school that year!). I like the folksy look of the little acorn. These are my two fall exchanges for the Seasonal Exchange. 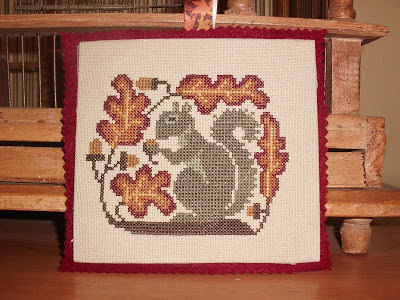 I stitched the little squirrel and finished it as a flat ornament. The pumpkin pillow was stitched for me by Laura. I love the gold beaded trim she used. 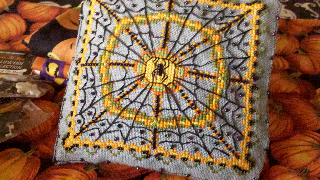 It is a Bent Creek design, I know because I have wanted to stitch this one for myself for a while now. . Happy Halloween everyone!!! If you are here for the blog hop my letter is "C" (like candy or cats or chills!) 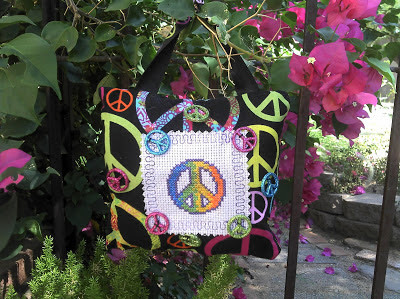 Also the next blog you need to visit is Stitches by Carin. I hope everyone has a super spooky Halloween filled with candy and fun! We are off trick or treating tonight with Glenda the good witch, and the Wicked Witch of the East! 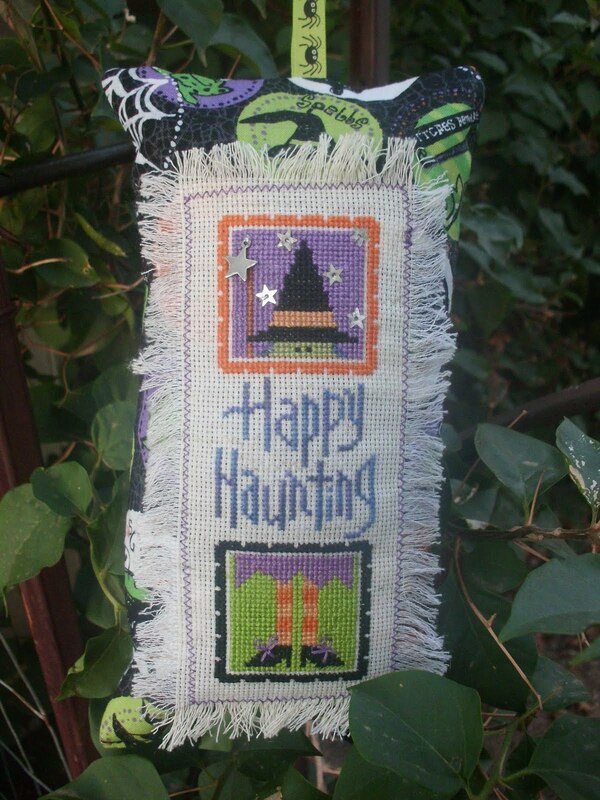 EEEKKK Halloween is tomorrow! Are you ready? Costume set, candy in the bowl? I just have to go get candy tomorrow morning and I will be ready! 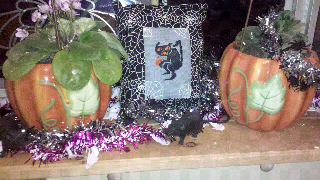 I have most of my Halloween pieces out and on display (I think I still have 10 or so finished ones that I never made into anything this year). 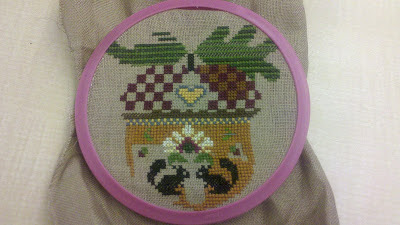 This one I have honestly forgotten who the designer was, I stitched it such a while ago. This is what we spent our evening doing. 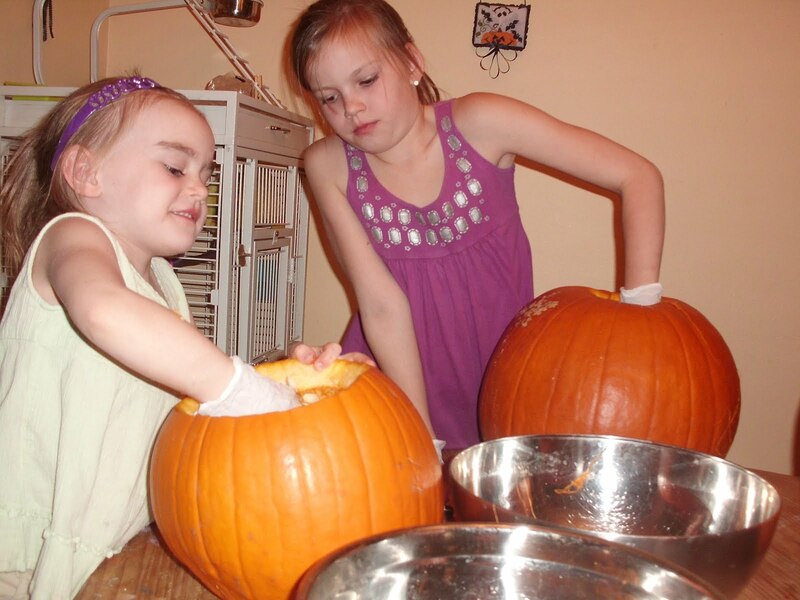 Carving pumpkins. I am actually a little allergic to the guts of the pumpkin so I have to wear gloves to clean out my pumpkin. Weird allergy I know. Pumpkins and lemons are the only two things that get to me, so I guess I can say I am lucky! 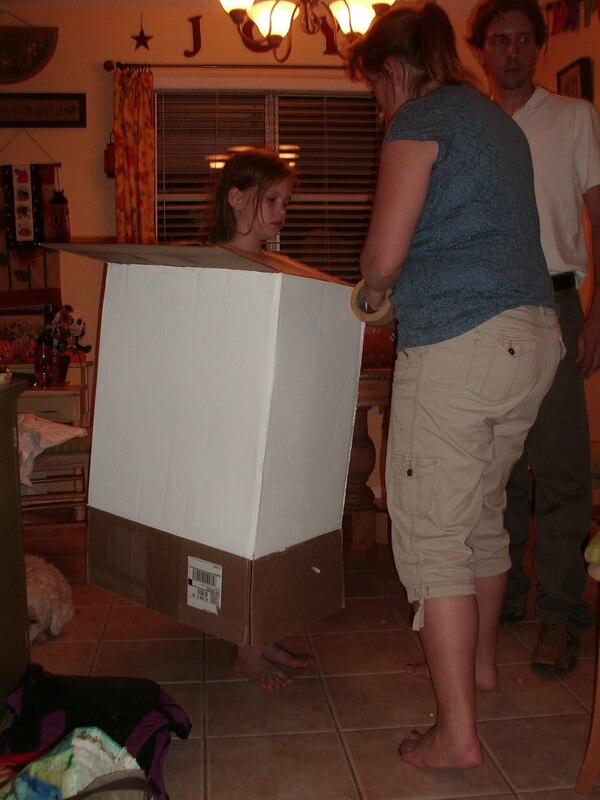 And this is what we spent the last part of the evening, finishing up my oldest daughter's costume. I am excited to show you tomorrow the finished result! 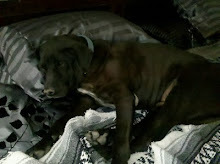 I missed blogging yesterday due to a doggy emergency. I volunteer with a local rescue group and they needed a foster home for 5 border collies that had been found at an abandoned home. We went and got them and about 8 puppies out of just a dirt pit. So I spent the day driving dogs to vets and giving lots of dog baths. Unfortunately one of them has an injury to her leg that is so bad the vet said they may have to amputate! We go for x-rays tomorrow, so if everyone could send prayers and good thoughts for a sweet little dog named Mary, I am hoping for some miracle that she can keep her leg and heal! Two more days until Halloween, OH MY! I was feeling brave tonight, so I tried a new finishing technique. I think I like how it turned out too. This one is a Bent Creek holiday snapper. I love the black cats whiskers. 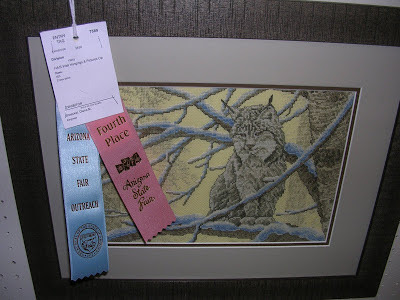 I backed it with a thin piece of cardboard and then hot glued it onto a piece of felt with a ribbon in between. Super quick and easy for a small little ornament. I was also feeling brave updating my blog's background, I hope it doesn't slow down how fast my page loads. Sometimes when people have music on their blogs it takes forever for their pages to load on my computer. Though maybe that's just because my computer is older than at least one of my children! 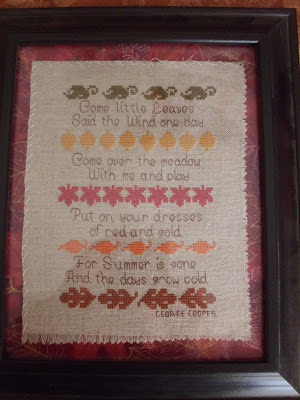 Another Lizzie Kate, this one was an old one I pulled from my finished basket, I can tell it is older because I rarely stitch on 14ct Aida anymore. I still love L*K though! 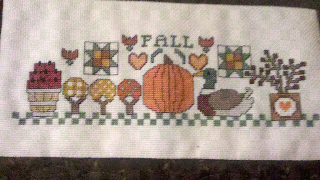 It sits on my fall pumpkin shelf as it is too small to actually go on the couch (plus the dogs might see it as a chew toy). I love the mini-pumpkins you can get at the grocery store this time of year for so cheap. I always get a bunch of them to scatter around the house. Zoey asked if we could carve one of them and I told her I didn't even know if they had seeds/pulp inside of them. I am exhausted this evening. 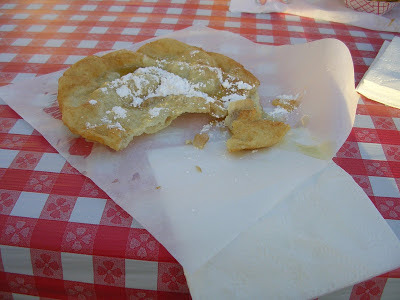 I spent most of my day visiting blogs and playing around on Pinterest. Then this evening sweet boyfriend and I went on a 10 mile bike ride. I haven't ridden all summer long and my legs were killing me! I signed up recently for the P.F. Changs half marathon they hold here every January and I am so nervous about it. I need to start running more, and winter time is the perfect season here in AZ to be back outdoors. I have ran this race once before two years ago, and it was a lot of fun. But each time I do any group running event I always get so scared I am going to be the very last one to cross the finish line. I will not buy candy yet...I will not buy candy yet .. i will not buy and eat all the Halloween candy yet before Halloween even gets here! This one was out of this years JCS Halloween ornament issue. I made it for a Halloween exchange on HOE. 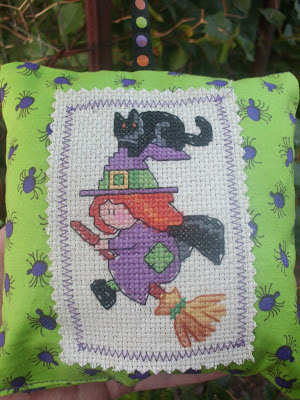 I really liked all the beading on it, but discovered I am way too fussy to stitch spiderwebs. I wanted mine to match the chart exactly and kept restitching it! Six more days until Halloween! EEK! 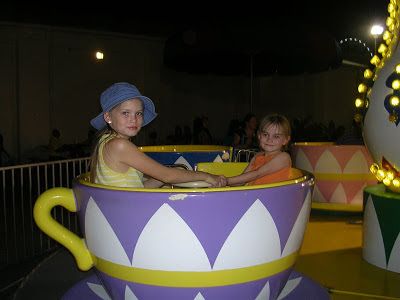 This is a Lizzie Kate one obviously. I love the plain black against the purple fabric. Someone asked how many Halloween pieces I actually had. I would guesstimate that I have probably stitched about 20 small ornaments and about 5 larger pieces? I also have probably about 10 Halloween/Fall pieces that others have stitched and I have received via exchanges or found in antique/second hand stores. This weekend I will have to drag out my WIP box (I have a seperate one for Halloween) and take some pics of the ones that may or may not be finished in time for Halloween. 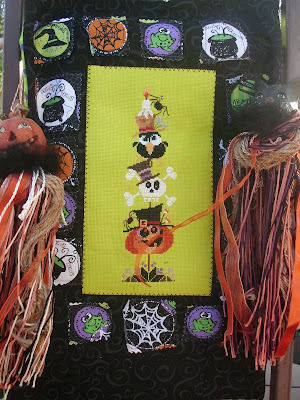 I am still stiching Halloween stuff, but I also had a lot of small projects that just needed finishing and doing this little month of blogging has really helped me to get stuff put together and out on display! Someone also asked if I was going to be doing a Christmas countdown. While I love stitching Christmas ornaments too, I sadly only have two stitched ornaments to my name for Christmas because most of my Christmas stitching gets given away as presents. I do always enjoy going to family's houses and seeing my little ornaments on their trees. 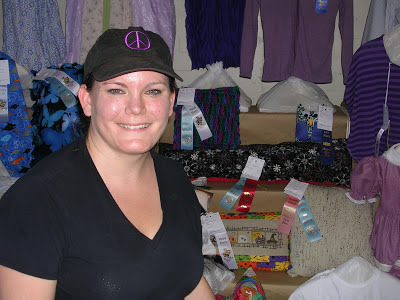 I also like knowing that my gifts are unique and hand-made and that I put some thought into what types of ornaments they would like. And this was my mommy-project for the day. Do you see the orange pumpkin on the left side of her shirt? That little pumpkin was once attatched to the front of a chocolate stained mess of a shirt that had been through several of my oldest daughters Halloween adventures and was passed down to my youngest pictured here. She wanted to wear said mess of a shirt out last week and I said NO WAY it's more brown than orange, which ended in tears and "but I love this pumpkin!". Soooo I wound up promising I would use the pumpkin to make a new shirt. Which would have been easy if I hadn't sewn the front of the shirt to the back on my first attempt! 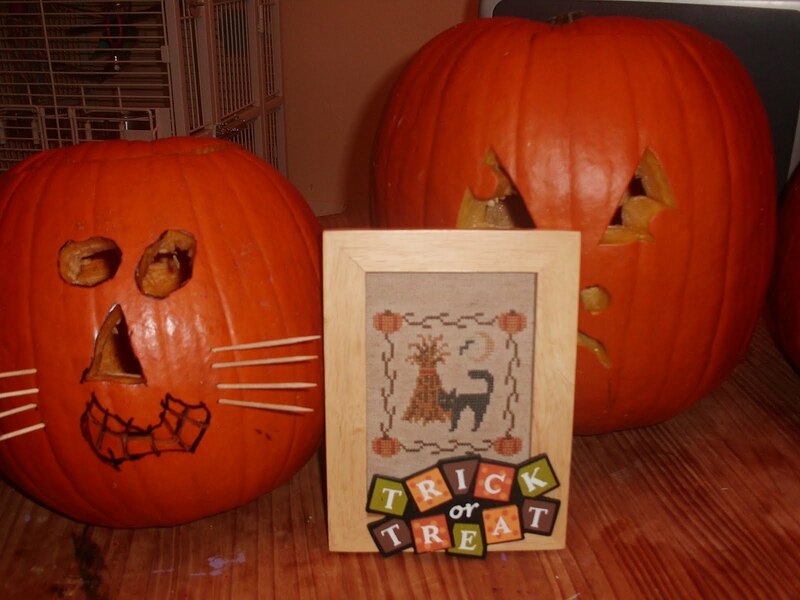 This is my finished effort though, little Zoe is happy and the sequined pumpkin lives to see another Halloween. 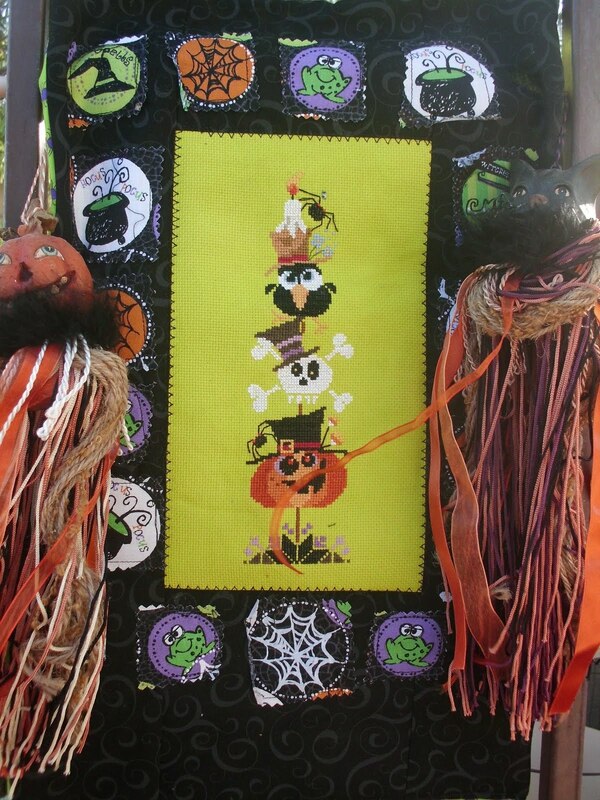 Another pic of the pumpkin shirt, and of some of our outdoor Halloween decor. I have been meaning to get a photo of the whole front yard, we are the most decorated house on our block! For now though just our watch cats, I tell the girls they guard our front door from any ghosts or goblins. This little witch is out of an older cross stitch booklet called "Trick or Treat". 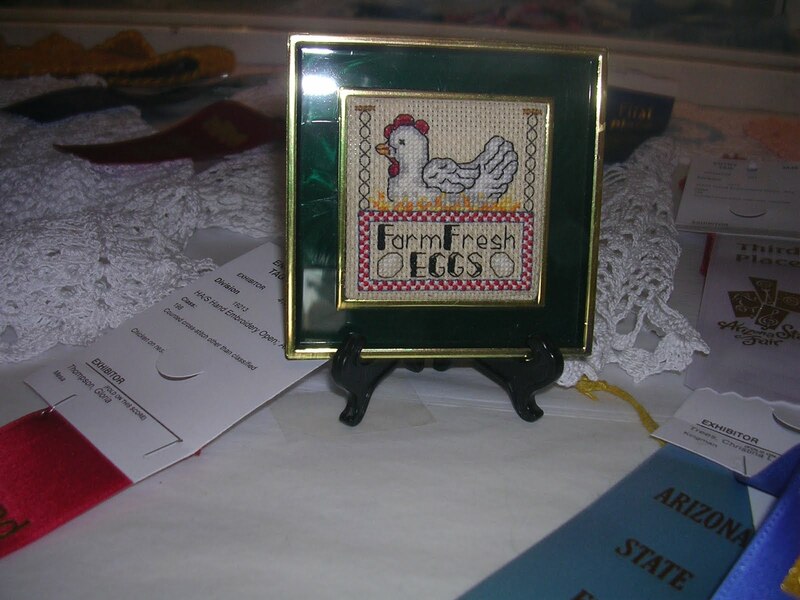 I got the booklet for a quarter at our annual book sale held at the fairgrounds each February. It was the best quarter I have ever spent! So far I have stitched six little designs out of it, and they are all super cute. 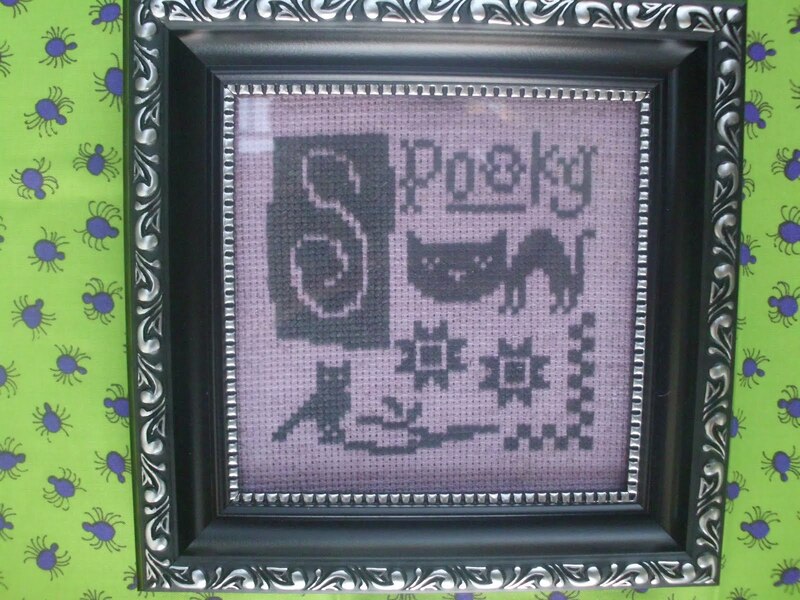 I finished it with simple Jo-Ann's fabric (I liked the purple spiders). I wanted to ask my fellow dog lovers out there an odd question, mainly because my boyfriend (who normally is pretty good at ignoring my eccentricities)made fun of me for it. When your dog gets spooked does it make you spooked ever? I run in the evenings with my German shepherd mix dog, and the other evening she was just spooked. She was running with her tail between her legs and looking every direction at once and then she started jumping up on me which she never does with a look of "i'm scared!". Well I kind of knew what had spooked her(there were fireworks at the high school homecoming the night before), but she kept looking behind us so much that I started looking behind us and eventually got spooked myself and turned around and went home. We had only ran for about 10 minutes so of course boyfriend was surprised to see us home. When he asked why I told him, and he thought it was funny I got spooked by a dog. But honestly I count on her for protection and if she is scared then I don't want to be out there. Well that, and I have been watching too much Walking Dead at home! Only 10 more days! How has Halloween crept up on me so fast! I'm not even done decorating yet. 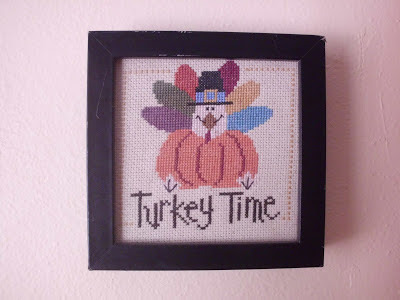 I'm also not ready for all the busy-ness of the Thanksgiving and Christmas season. This piece I actually found in an antique shop. 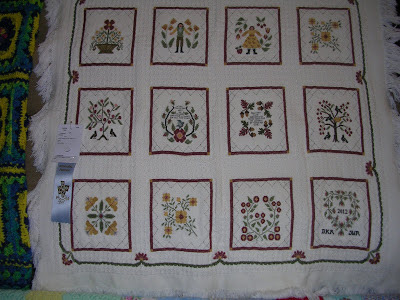 It is a quilted wall hanging with all 4 seasons on it. This is just the fall square. 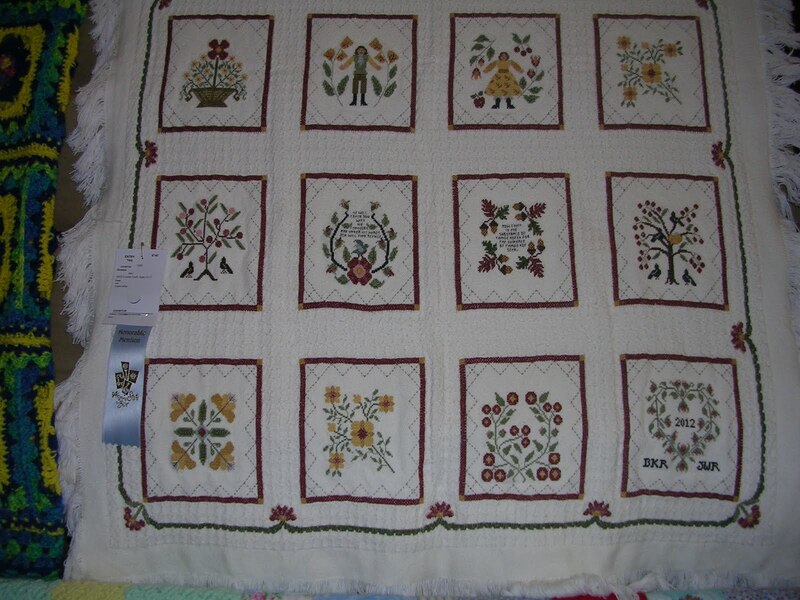 It obviously took a lot of work, and the border is nicely quilted too. 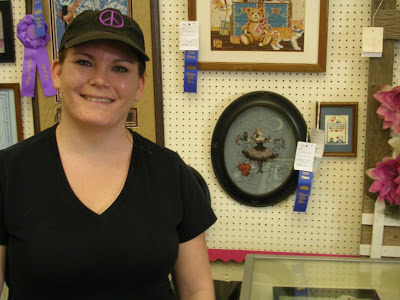 I love good cross stitch finds, but it does make me a little sad to see someone's hard work for sale. This is done on Aida, and is obviously an older design but I still like it. This one is another Prairie Schooler out of this years JCS ornament issue. 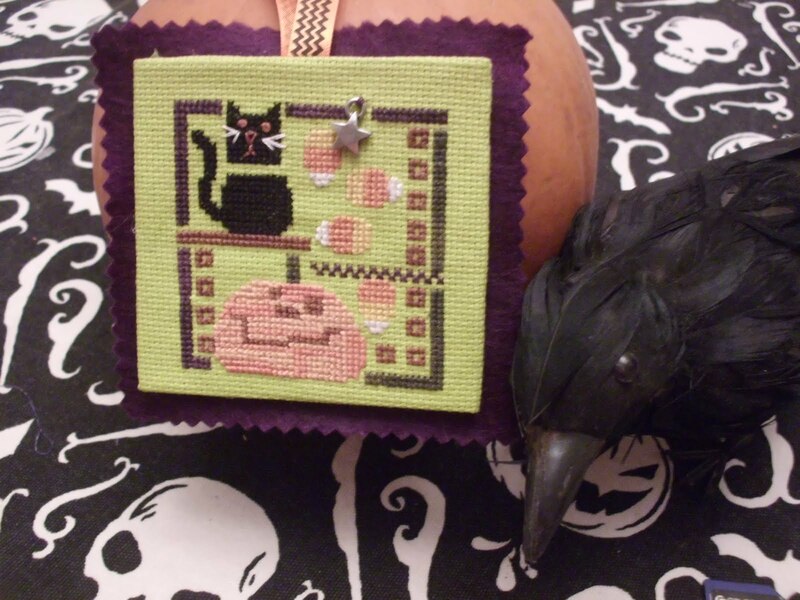 He was quick to stitch, but I wish I had used 3 strands of black instead of 2. Up close it doesn't cover as well as I would like. The spider webs in the corner were my idea. 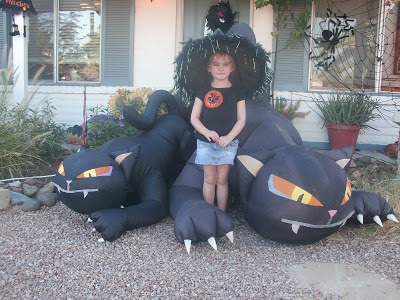 I wanted to tie into the fabric, and couldn't find a black cat fabric I liked. It was hard to match the bluish-grey linen. 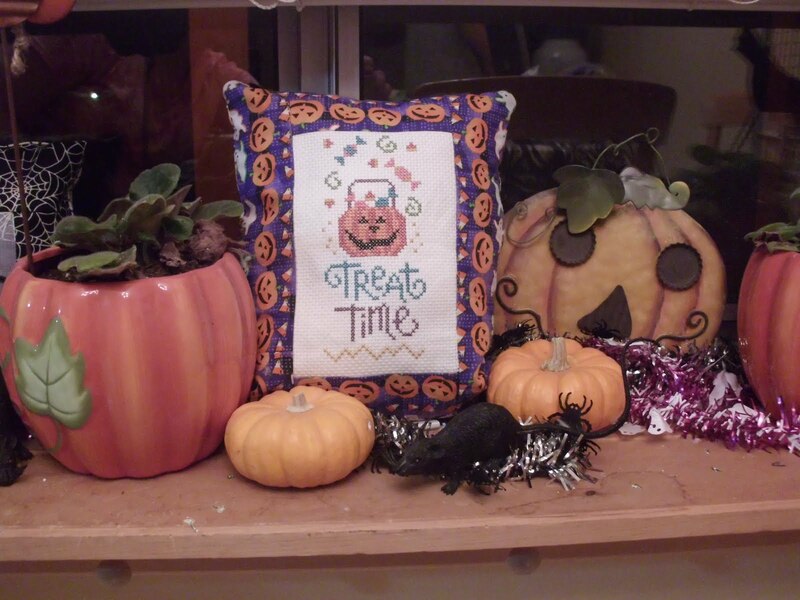 The little pumpkin pots next to it in the picture I actually found at Walmart of all places, so I have my own window-sill pumpkin patch now. Hope everyone is having a great weekend! I didn't forget! 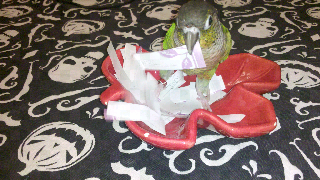 Karma, my own random number generator ( and paper shredder if I gave her enough time) picked Jodi S. as my giveaway winner. Congratulations Jodi! I didn't see your email address in your profile page, if you could email me and I will get it out in the mail to you. 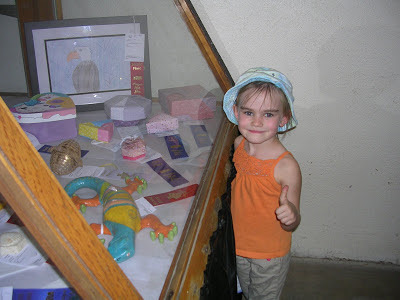 This was Maya's entry into the fair. 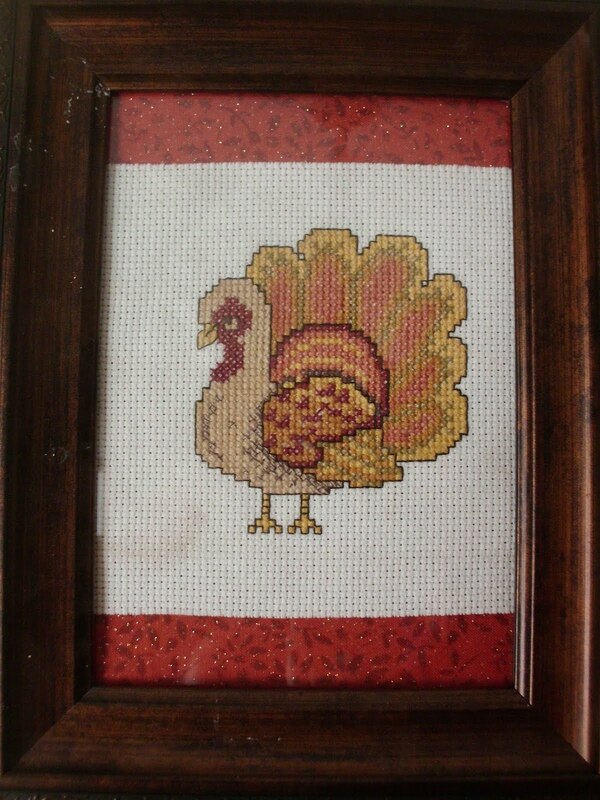 She is nine this year and this was her first cross stitch. I helped her finish it into a pillow, but she actually did all the stitching herself. 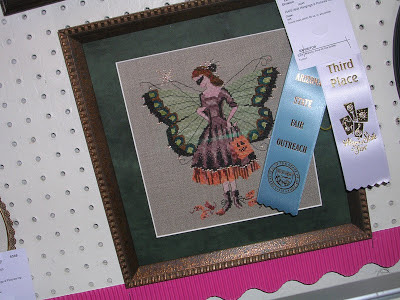 She won a blue ribbon again this year. Last year she had sewn a Hello Kitty purse out of felt/yarn and got a blue ribbon too. 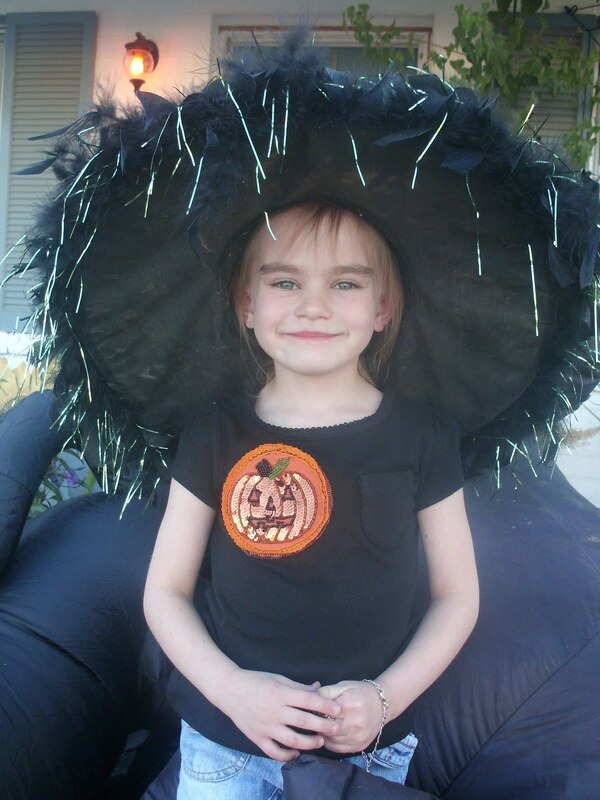 Another Mirabilia "Halloween Fairy". 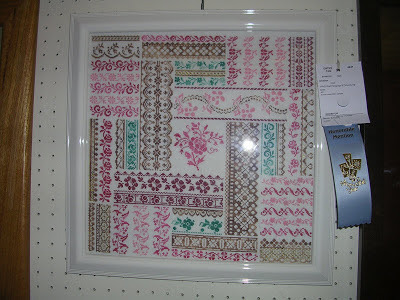 I loved seeing this one in person, I had been eyeing the chart already. 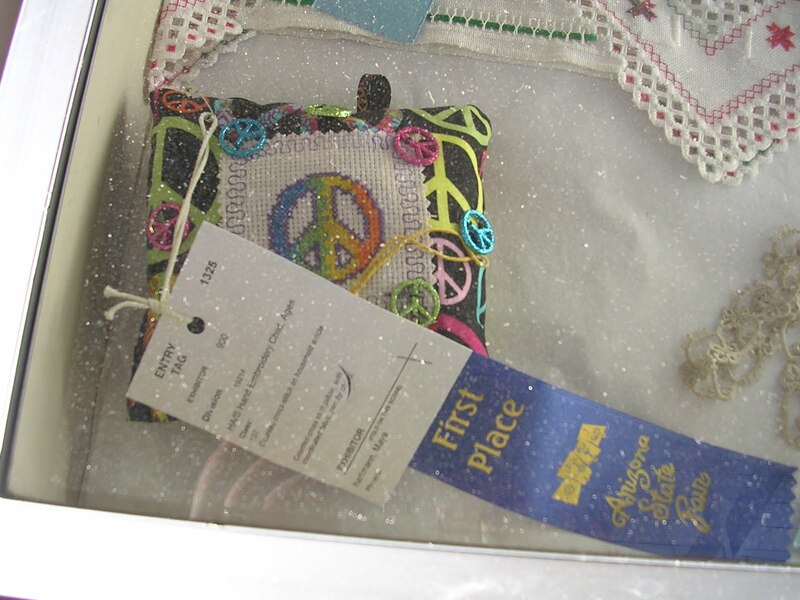 This one was a crocheted blanket that had cross stitching on each of the squares. 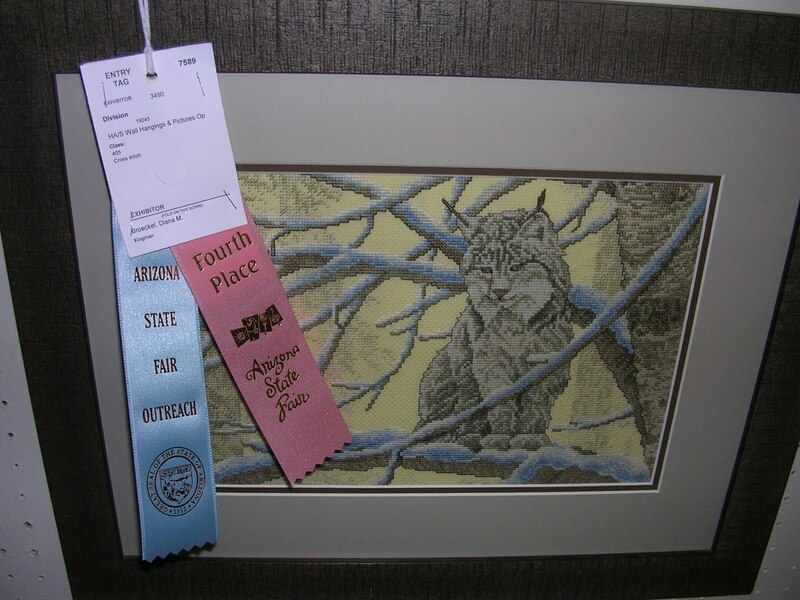 It was in youth division, which makes me wonder how old this talented stitcher was. 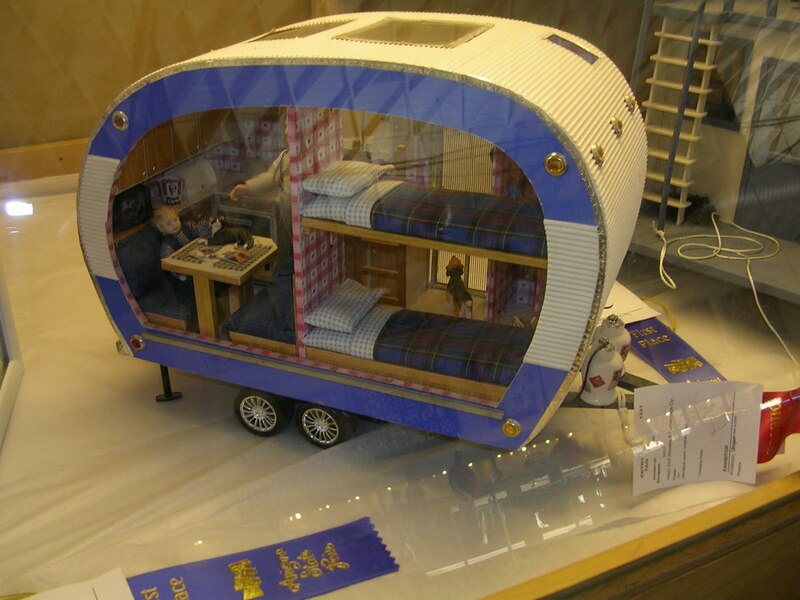 Not cross stitch, but I loved this miniature trailer. The outside of it was corrugated cardboard. I loved all the tiny details inside of it too. And just a cute small to finish with. I normally am not a fan of chickens, but this one was too cute. 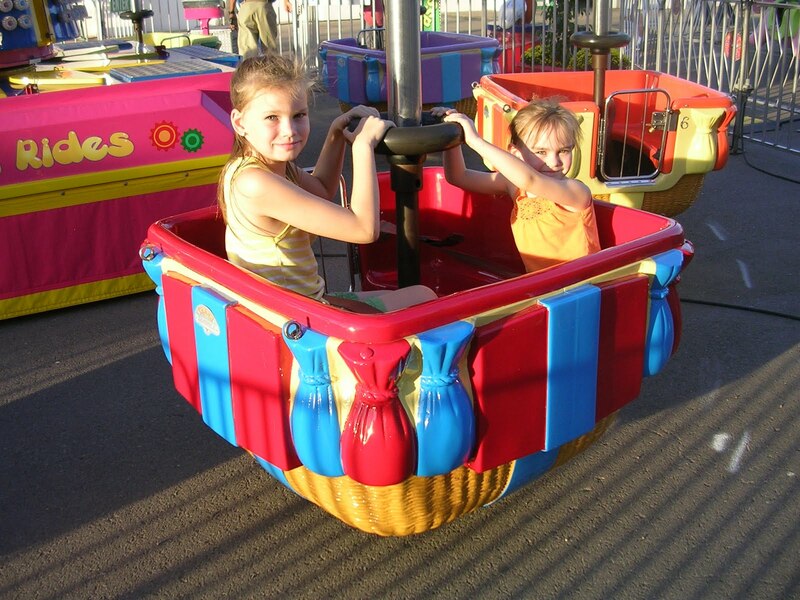 SPIN UNTIL YOU MAKE YOUR SISTER SICK RIDES! 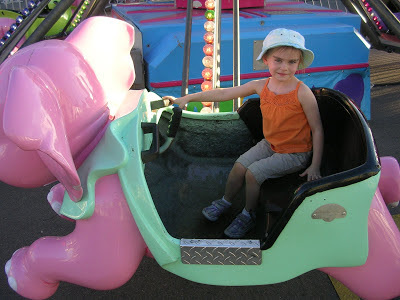 MORE RIDES! SPIN UNTIL YOU MAKE YOUR SISTER SICK RIDES! This was yesterday's finishing project. 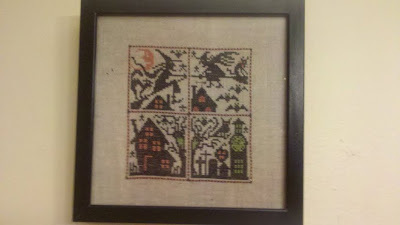 I actually completed the cross stitch 2 years ago, it was a really cool chart I purchased off of Etsy. 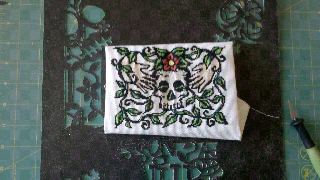 I knew I wanted to do a special mat for it, day of the dead inspired. It took me about 3 hours yesterday to hand cut this. You can't see it in the picture but the paper is a black glittery card stock. Then I glued the thinner velum red paper behind it so you couldn't see the cross stitch fabric. 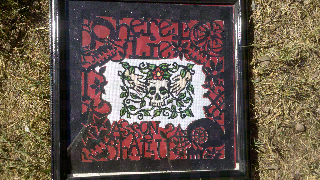 It's hard to read in the picture, but the lettering says "here I lie, as soon shall you." My hand was so cramped from holding the exacto knife for that long it felt like I had arthritis. It was really hard to get a good picture where you could see the details, so please ignore my dead lawn behind it. I was just happy to be able to take the picture outside in daylight. Since it doesn't snow here we have to plant different winter grass to keep the lawn green, and there just hasn't been time yet. Whew, I almost forgot to post today. It is hard blogging every day! What's also hard is taking a good picture when most of my blogging and crafting and photography sessions occur after the wee ones go to bed. Especially now that it is getting dark right around dinner time. Not that I mind the change of seasons, I have been loving the cooler weather (by cooler I mean highs only in the 90's here in AZ). And the dogs have been enjoying longer walks at night too. We have started to smell fireplaces going in the evenings too, and it is such a nice cozy smell. Yup, definitely my favorite season!